Two things at the very beginning - this is a Tamil dubbed movie, and it stars Vijaykant. We could end right here and no follower of Vijaykant's movies would feel cheated because he would pretty much know the rest of the movie. This is another of those testosterone overdose films - the hormone is practically oozing out of the screen. Vijaykant is there in about 99 out of every 100 frames, and consequently there isn't much place (and quite literally too) for anyone else. S P Jaisimha is a ruthless upholder of the law (scary thought, wot?) and won't hesitate to kill even a police officer if he felt that he was a bad 'un. And so he goes around bashing up the baddies - supported by a zillion sound effects. The movie starts out with a terrorist bombing (our guys just can't stay away from the religion issue, can they? ), and this story track is picked up again about 2 hours later. In between, our man rescues the hapless Nandini (Ramya Krishna), a TV reporter who is immediately besotted with him, and does lots of other more important things. Chidambaram (Prakash Raj) is the big fish, and is the saving grace of this film, acting-wise. He is very believable as a kingpin with arms longer than the law, except that his character's credibility takes a beating since Jaisimha appears to be able to walk into his house and thrash the living daylights out of him anytime. Somewhere here comes Sakshi, who's Jaisimha's wife (?). She appears in a sum total of three frames in the entire movie, so this track is entirely wasted. Eventually, the whole thing boils down to Jaisimha flushing out the force and to his showdown with Chidambaram, who in turn comes up with the twist in the tale. Now there's no fun if I tell you that too, is there? And finally, our man goes into the hills and finishes off the terrorist threat and saves the world. Yippee! It's a crime against the audience to subject them to Vijaykant dancing. And his hand and face movements make more noise than a twenty-year-old Ambassador. Ramya shakes around for two songs and disappears. 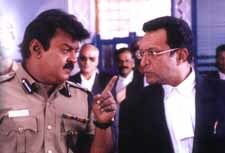 And ironically, for a man who loves his police job so much, Vijaykant is in uniform only twice in the whole movie. The rest of the time he's seriously in a costume competition with Govinda. This is strictly for the Vijaykant fans, however many of them are out here. Be the first to comment on S P Jayasimha! Just use the simple form below. fullhyd.com has 700,000+ monthly visits. Tell Hyderabad what you feel about S P Jayasimha!